It’s Time to Increase the Utility and Ruggedness of the Mule Before an Upcoming Round of Performance Upgrades! The Mule is our project truck that doubles as GM EFI’s daily driver, parts hauler, and tow pig for our other project cars. It wasn’t originally intended to be included in the project car corral, but as gearheads, we can’t leave anything alone. Plus, there’s just so much potential in these trucks, and ways you can improve both performance and appearance. 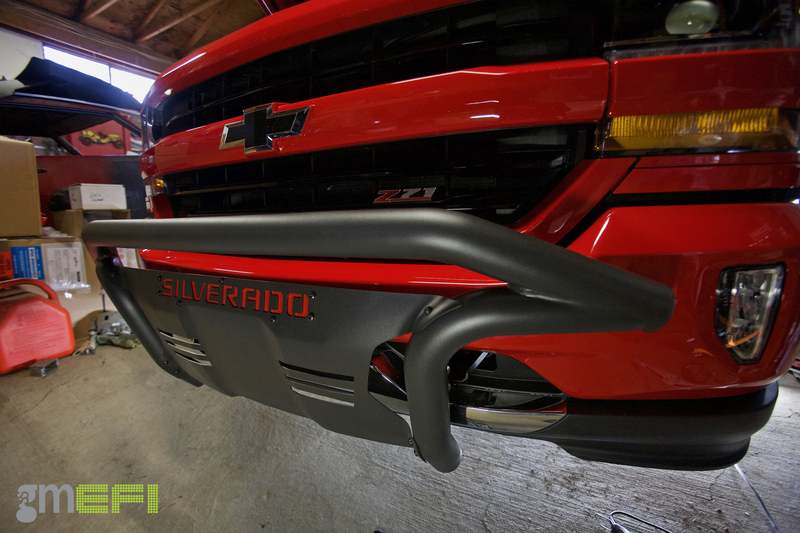 Let’s face it, the aftermarket is flooded with Silverado parts that are tempting us to modify the truck. It’s one of the newest members of the family, this 4-wheel drive is powered by Chevy’s 5.3-liter V8 and has the optional Rally Edition package. Since joining the GM EFI ranks, it’s been through a thorough road test, has gotten a set of front and rear Hellwig sway bars to add stability in the corners, a Brembo brake upgrade, and protection from road debris with the help of XPEL protective film. You may remember how The Mule looked when we first picked it up back in the Fall of 2016. It was certainly a stand out on the daily commute, but you know us, we can’t leave things well enough alone. Not too much has changed, aesthetically, but we felt that since there are now tons of copy cats running around out there (at least in our area) it was time time switch it up a bit! The next series of upgrades that have been done give the Mule more utility and function. We landed on using all Chevy Performance Parts for this project because we didn’t want to gamble with cheap off-brand components, or use a mishmash of hardware that would leave us with an odd end result. A lot of the other choices we checked out just seemed pretty flimsy, and when compared to Chevy Performance styling and performance accessories, it just made sense to go with the company that designed the truck in the first place. You can order the Sport Bar with or without the LED off-road lighting, which is everything you see here. There will still be some plug and lay wiring involved, as that will allow the CHMSL to become functional while under braking. The LED lights also include covers for when they’re not in use, as protective covers or dimmers, as theLED lights are both incredibly bright, and not legal for road use. Installing the bed-mounted Chevrolet Performance Sport Bar and then the off-road lights was the most challenging part of this round of tasks. It’s not a difficult part to install, per say, but it’s a little more challenging than placing floor mats. It’s definitely recommended to enlist the help of a buddy when doing the heavy lifting, as the Sport Bar has a few pounds of weight behind it, and also is a little awkward to lift and mount by yourself. Even though the installation of the bar itself was easy to figure out, we’re still grateful for the detailed instructions included from the dealer. All of the hardware is included for the bar and the mounting of the lights. With everything laid out, it’s time to get this on. The bar uses existing holes to create mounting points. The mounts make the bar completely removable. Just bolt the bar in place. Covers are provided to hide the bolts. Put the covers on for a clean look. And that’s it, it can go back to stock at any time with these brackets. One thing to note is the bar is not in the way in case we decide to get a bed cover in the future. You’ll more than likely have to cut out the hole in the bed protector, too, to allow access for the wiring for the lights. The Sport Bar adds function and style with added protection. It easily bolts to your side rails and allows us to use the off-road light kit that will come in good use when we’re on backroads towing our project cars around, or to and from the track at night. They’re also good for providing a little more light when parking a big tow set — but don’t worry, we aren’t the kind of people who drive around with off-road lights on all the time, those guys should be ashamed! Wiring in the lights requires dropping the filler neck on the gas tank to run them so you don’t have expose wires just dangling from the light bar. You have to replace the factory light switch, too. The Sport Bar kit with the optional LED lighting package requires the use of a new control panel for the outside lighting. For this part, and it pains us to say, you might want to head on to your local dealer and let them do the wiring that will route to your under-hood fuse box and accessories. It’s highly recommended that our readers have the dealer do it, especially if they’re uncomfortable wiring up a new vehicle, and for the sake of the warranty. Plus, the dash panelling can be a little tricky to remove, too, since you have to swap out the light switch from the factory installed unit. Now on to the front of the truck, the Nudge Bar installation. The Chevrolet Performance Nudge Bar again comes with all the hardware and instructions you need to install it, and installation is extremely straightforward. This one can be a little tricky to install at once since the room you’re working with is limited at the front of the truck. It definitely gives the Mule a hulking look and seriously compliments the Silverado’s body lines. This adds a little more protection to the front end, and can take minor accidents, but don’t plan it surviving an auto derby, if that’s your thing. These are the stock tow hooks for the front bumper. Those come off and stay off when you install the front nudge bar. Mounting this up was a breeze. It installs in place of the factory tow hooks. After installed, it looks like it came mounted from the factory. We found it easiest, per the instructions, to install the mounts that use the same pick-up points and the tow hooks, first. Once they’re in you could ask for a friend to help hold the bar, or you can prop the bar up with something to keep it in place while you install the mounting hardware, connecting the mounts to the bar itself. Easy peasy! The black powered coated nudge bar is extremely high quality in tubular design and finish. It also won’t interfere with the function of your airbags, which is good news for you derby people. To no surprise, the nudge bar fits perfectly onto the front end, and if you’re unfortunate enough to live in a state where you are required to have a front mounted license plate, there’s provisions for that too. You simply mark off the mounting holes, using your license plate and a piece of paper for a template, drill the holes accordingly and use the provided hardware from Chevrolet Performance. Now onto the interior, the floor mats and rear cargo storage. If you’ve ever installed floor mats, you know how hard this can be, but somehow we managed to get them in. We jest, but there is a point here, you need floor mats to protect your floors from your muddy and grease covered shoes. Installation is a matter of vacuuming your carpet and placing them where you need them, it’s simple insurance for your interior. These have to go in second to last because they will partially be covered by the cargo organizer. The rear back under seat organizer might not be as glamorous as the bars, but it is much needed. This truck gets used a lot to travel from project to project, and to document installs. There’s a lot of gear that comes along with that, and that’s gear that we don’t want sliding around the truck bed, or exposed to the elements. This one is made specifically for a double cab, and fits snuggly and surprisingly out of the way. This is held in place with brackets and doesn’t require modifications to the seat or floor. What we didn’t expect was how the organizer cleaned up the look of the back seats, which is a (welcomed) added bonus! Getting all that done was an easy day’s work, with no one rushing to get through it. Within just a few hours, the Mule has a totally overhauled look and much more room for storage, as well as more lighting and protection. This has been one of the easier projects considering how many tasks we knocked out at one time.